BOOK REVIEW- AND A HAPPY NEW YEAR? TITLE: And a Happy New Year? Spinster Club girls Evie, Amber and Lottie are reunited for the mother of all New Year's Eve parties. Having spent months apart since finishing college, they've got plenty to catch up on: how is Evie juggling a relationship with her OCD? Does Amber plan to spend more time with Kyle in America? And where did Lottie end up? Get ready for some serious partying - and some major New Year's revelations - from everyone's favourite cheesy-snack-loving feminists. 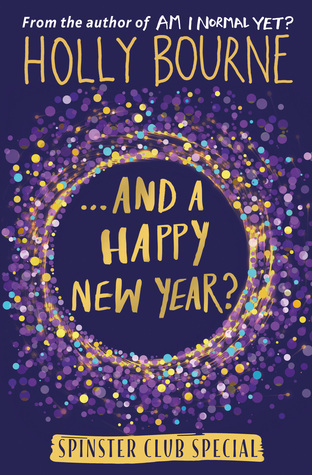 Evie, Amber and Lottie are reunited for a New Year's Eve special- the final book after the Spinster Club Trilogy. They have spent months apart after finishing college, and their lives have started to move on, but they all have some secrets to hide. Will their friendship and special bond survive through life's trials and tribulations? 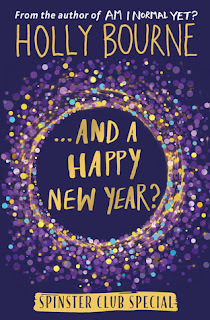 After loving all of the girl's individually in each of their books, reading 'And A Happy New Year' reminded me how sad I was to see the last of the trio. Even though this Spinster Club Special is shorter than all of the other novels, I still built up an emotional connection to Evie, Amber and Lottie once again: the feels all came flooding back. After the ending of What's a Girl Gotta Do, I was desperate to find out where Lottie had ended up, so it was perfect that the books linked seamlessly. I adored how the chapters in the book were in the different points of view of the girl's, making it so interesting to revisit Evie and Amber's lives. Holly Bourne once again had me captivated from the first to last page; her writing is just fabulous, and so relatable. An easy 5/5: I know many devoted readers will throughly miss the Spinster Club.